Have you tried cashew butter? If you can’t or don’t eat peanut butter, cashew butter is a delicious replacement. It’s creamy and deliciously flavorful. I mostly use it to make these cashew butter chocolate chip cookies, but I also like it on apples or just straight off the spoon. Making your own homemade cashew butter is really easy. It also much less expensive than buying pre-made cashew butter. I make my homemade cashew butter with organic roasted cashews that I buy at Costco or Trader Joe’s. You can also make raw cashew butter, but I like the flavor of the roasted cashews so I haven’t tried that yet. Keep reading to learn how to make cashew butter at home. Do I need to add extra oil? I never add oil to my homemade cashew butter. It may seem like your cashews aren’t going to grind up effectively on their own, but if you’re patient it will happen without you having to add any oil. How many cashews do you need? I used a pound of roast cashews when writing this recipe, but you can use more cashews if you want. I often do more like 1.5 pounds at a time. It will take your food processor longer to grind more cashews, but it should still work without a problem. One pound of cashews will make a little less than two cups of cashew butter. The main downside of making your own cashew butter is cleaning your food processor afterwards. Like peanut butter, cashew butter sticks pretty badly. I’ve found that it’s helpful to soak the whole food processor for several hours before trying to clean it. After soaking, I usually clean off the cashew butter with a brush and then put the whole thing in the dishwasher to finish up. Add cashews to your food processor. Turn food processor on and process until cashews become butter. For 1 pound of cashews, this takes about 10 minutes in my food processor. As cashews start to look like they're almost done, you'll want to stop the food processor a couple of times to scrape down the sides. Your food processor may become quite warm while making the cashew butter, but this is not a problem. Turn off the food processor when the cashew butter reaches the texture you prefer. I like my cashew butter to be very smooth and creamy. If you prefer yours more coarse, you can stop the food processor sooner. Store cashew butter in a lidded container in the fridge. A pint canning jar is perfect. If you're planning on using your cashew butter to make cashew butter chocolate chip cookies, I recommend portioning it out when it's warm because it's much easier to measure when warm. Then just store it in the fridge and it will be all ready when you're ready to make cookies. 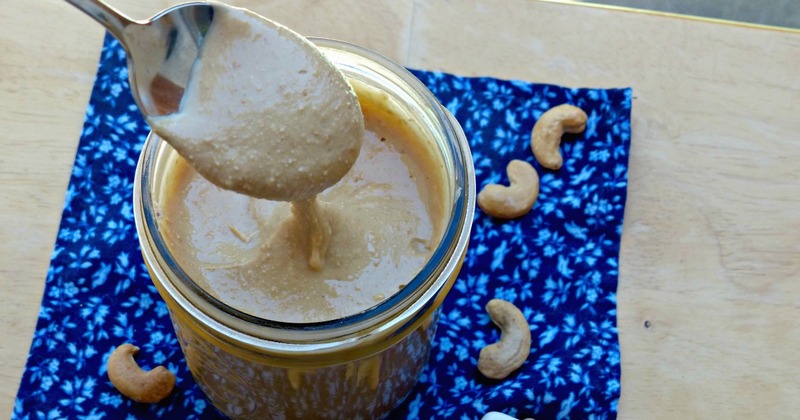 Have you made homemade cashew butter? What are your favorite ways to eat it?